Squeals of delight rang out from Israelis and Palestinians alike today, as the birth of an enchanting litter of Labrador-Chow puppies ushered in permanent peace to the embattled region. Citizens who were present at the birth wept tears of joy, knowing that the six darling mutts, whose mother was an Israeli-Jewish Labrador and whose father was a Palestinian-Muslim Chow, would change the world for the better. Esther Cohen, an Israeli-Jewish observer, described the momentous occasion. "People were streaming out of mosques and synagogues, hugging one another closely and tightly, regardless of faith or nationality. I've never experienced anything so powerful. 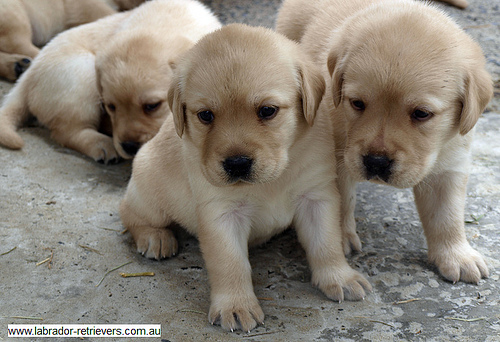 These puppies are the cutest things anyone has ever seen." Hearing the collective cooing, Israeli and Palestinian armed forces immediately ceased fire and threw their weapons into an enormous trash pile before running across the once-disputed Gaza Strip and West Bank to embrace their past enemies. Said a former Hamas leader, "We are united in our love for these charming babies, and I will stand alongside my Israeli brothers and sisters to raise these puppies, the children of our nation, in peace. One state or two states? No one even cares anymore." A newly-formed government made up of diverse representatives from all areas of the region made an immediate pronouncement to rename the country Salaam-Shalom, a touching ode to the unified tranquility these citizens have finally achieved. Fittingly, the human owners of the adorable pups were peacefully elected to serve as co-presidents of this new nation, and their first order of business was to design a new flag for Salaam-Shalom, bearing the images of the beloved, tiny dogs. In a joint statement, the newly-elected leaders expressed their desire to take the puppies on a road show to war-torn locales like Sudan and Syria, stating that, "The innocence and cuteness of these puppies could disarm even the most blood-thirsty humans. Let us all remain hopeful."